Another Mother’s Day has just come and gone. Let me tell y’all this one, well it was one for the books! The hubs and the sons’ all outdid themselves. Naturally, it started off with the Hubs letting me sleep in. I am in no way shape or form a morning person, ever. He also woke me up to a delicious omelet. My absolute favorite breakfast every, and he makes the best I’ve ever had. It’s by far one of my favorite traditions he’s established about this particular holiday. Extra sleep and super yummy breakfast? That’s a little slice of heaven however you cut it. After that he did some light yard work, an hour into which he asked me to come outside and survey the work. Friday I was supposed to pick up my mandavilla from the small neighborhood nursery. We had the spot, the trellis, the top soil- everything, in place. Only to get there, and they were completely sold out of the deep pink I had my heart set on. I didn’t cry, but my wonderful husband knew how upset I was. We’ve been talking about having one of these for years. Unbeknownst to me, he’d gotten up early and gone to another nursery 30 minutes away and paid a small fortune, but found the exact one I wanted. He’d also planted it for me and wound it around our trellis. He has his moments, but most of the time he can be pretty wonderful. This time, I did shed a tear or two, from love & happiness! He told me to get in the shower while he finished weed eating, and once we were both ready- we rode into town and ended up finding a couple hole in the wall restaraunts with great reviews. We settled on Awful Arthurs Seafood Company for supper, and it was sooooo good! We got the crab dip, which was full of shredded crab meat, and we chowed down on the same platters- crab cakes and shrimp, mine fried and his grilled. Everything about it was top notch. So I decided to make one of their favorites for dinner tonight. Something really heavy & comforting that they all love to say thank you, for loving me and for making me a Mom in the first place. 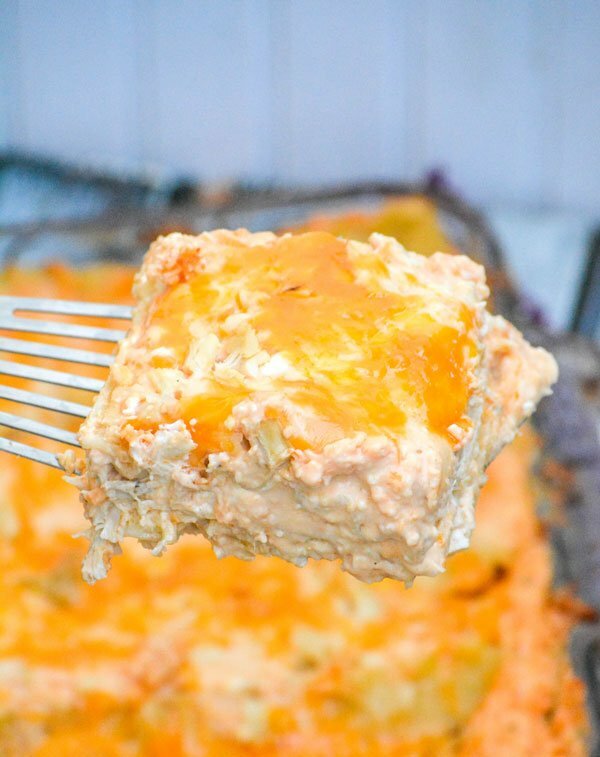 We could all use a little appreciation now and then, and this Cheesy Buffalo Ranch Chicken Lasagna is how I’m showing them mine. Lasagna, or lasagne, got it’s name from the Italinan word for the wide flat pasta that make up the base of the dishes many layers. Side note: lasagne is possibly one of the oldest types of pasta in the world. The name commonly refers to a dish made with several layers of lasagna pasta sheets alternated with sauces and other ingredients, like layers of meats, like sausage & ground beef, and cheese, typically a mixture of ricotta, mozzarella, and Parmesan- occasionally subbing cottage cheese. Ya’ll know by now though how much we loved to change things up, and put new spins on traditional favorites. Lasagna is one of our favorite things to give a new look to. We love chicken. We love buffalo sauce. We love ranch, cheese, AND pasta. 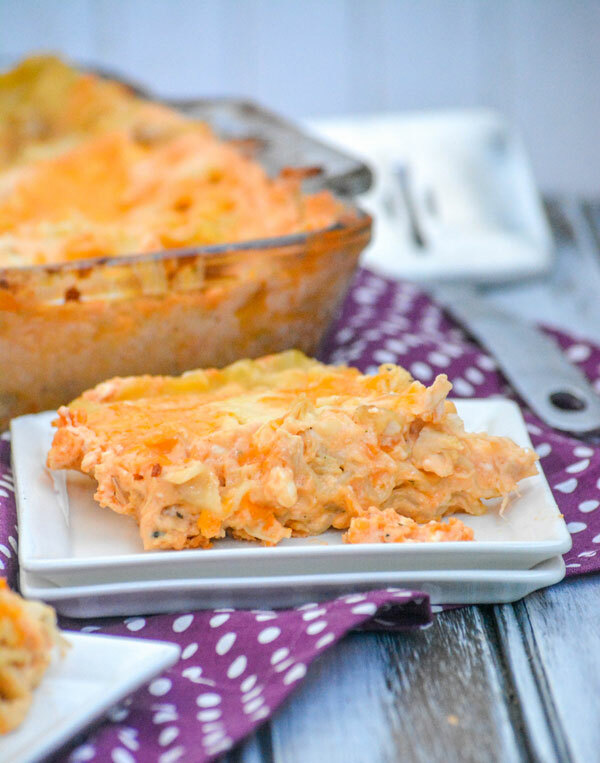 This Cheesy Buffalo Ranch Chicken Lasagna was born from just that love. 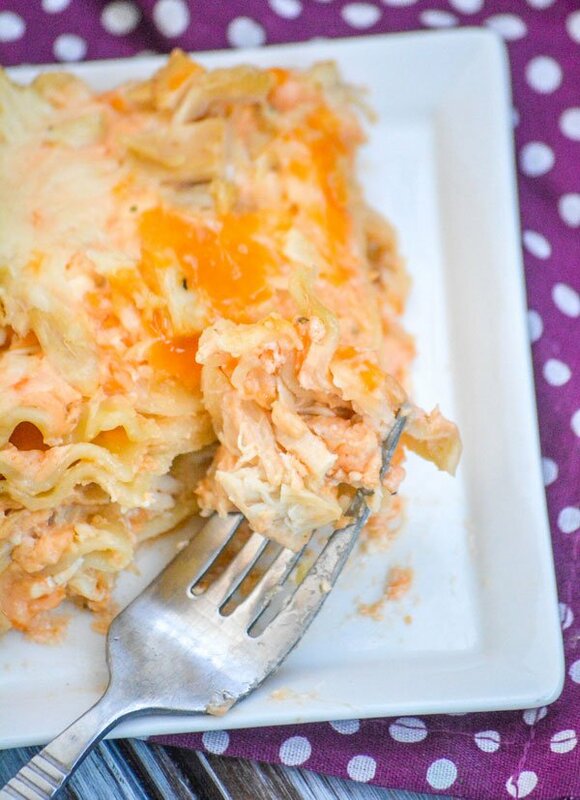 Layers of lasagne pasta are spread with a rich & creamy ranch and buffalo seasoned cheese mixture. 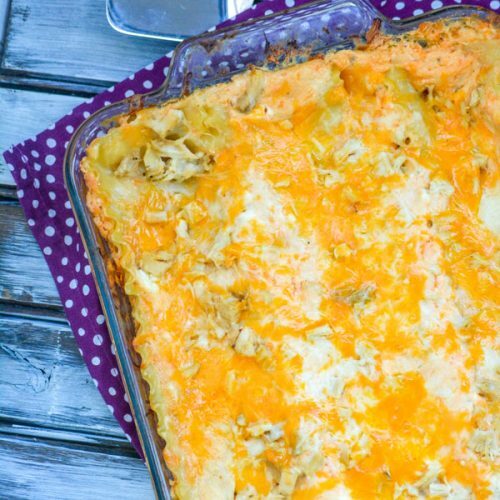 Topped with savory chunks of rotisserie chicken, and extra shredded cheeses- these layers are repeated until a beautiful, extra cheesy lasagna has been built. It’s perfect for anyone who loves ranch. 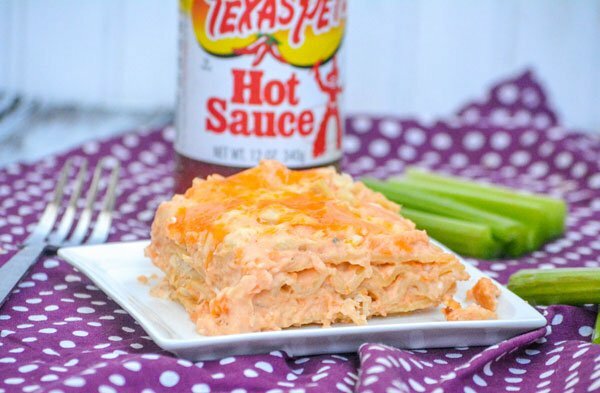 It’s perfect for anyone who loves buffalo sauce or buffalo wings. 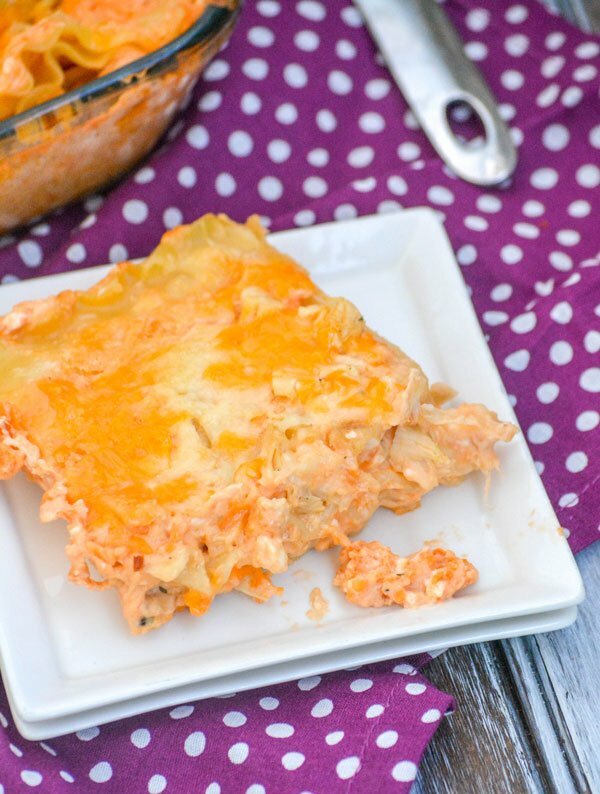 We’ve combined them into the ultimate one dish dinner in this Cheesy Buffalo Ranch Chicken Lasagna. Slice and serve as is, or top each with a drizzle of ranch, hot sauce, and a sprinkle of thinly sliced green onions and crumbled blue cheese. However you choose to garnish it, plate it alongside a simple side salad for a filling meal the whole family will adore. Other non-traditional lasagna recipes you might enjoy: Chicken Caesar Lasagna, Breakfast Lasagna, Pierogi Lasagna, & Lasagna Soup. 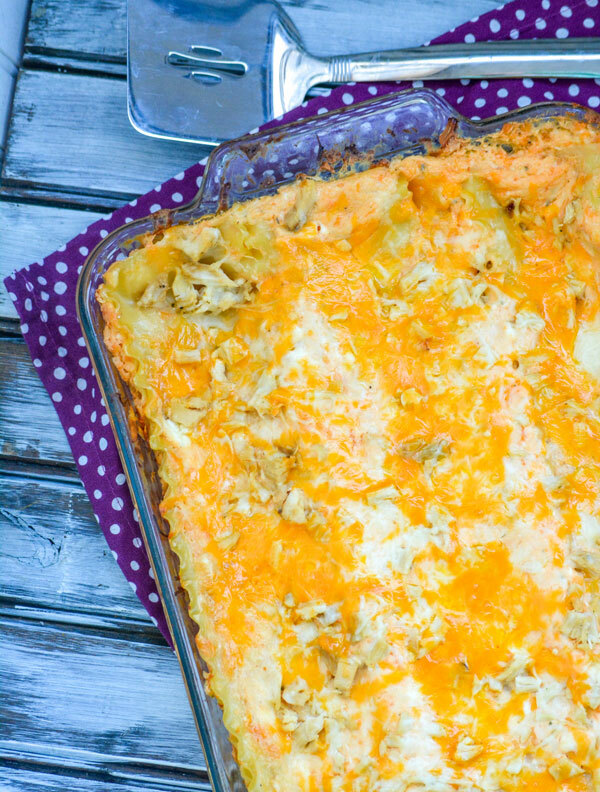 An easy, cheesy lasagna that features chunks of rotisserie chicken layered with buffalo sauce and ranch seasoning for a fun, new twist on the classic pasta dinner. In the bowl of a stand mixer, add the cream cheese, ranch, buffalo sauce, milk, & 1 1/2 cups of each cheese. Mix together, just until evenly combined. Spray a 9x13" baking dish with non stick cooking spray. Spread 1/4 of the cheese mixture evenly out over the bottom of the pan. Cover with a layer of pasta, overlapping the noodles as necessary to create a smooth, solid layer. Spread another 1/4 of the cheese mixture evenly out over the pasta. Top with half the chicken. Repeat with another layer of pasta, cheese mixture, and chicken. Top with the remaining noodles. Spread the rest of the cheese mixture evenly out over top. Sprinkle the remaining cheese evenly out over top. Cover the dish tightly with foil. Bake at 375 degrees for 45 minutes. Remove the foil. Bake an additional 10 minutes, or until the cheese is hot & bubbly. Remove the lasagna from the oven. Let rest for 8-10 minutes. Slice and serve, topped with a drizzle of ranch, sliced green onions, and blue cheese crumbles- as desired. What a lovely Mother’s Day! How sweet of your husband to sneak out and make your morning extra special! I am glad you liked the lasagna. My mom has made it for family dinner with all of my siblings too and it was a hit with them as well! Thanks for sharing this recipe with Fiesta Friday!